SA AMSAT is a specialist organisation that focuses on amateur satellites and weak signal communication. 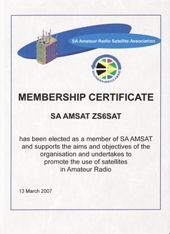 SA AMSAT is affiliated to the South African Radio League, the national body for Amateur Radio in South Africa. It also has strong links with other AMSAT organisations worldwide. To render active assistance to AMSAT on a worldwide basis and to IARU Region 1 Satellite Coordinating Group.